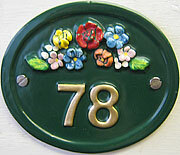 Hayne-West manufactures a range of quality house number plaques. 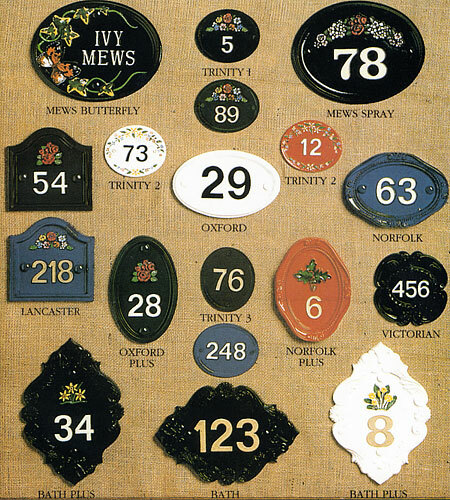 Your house number can be as simple or as decorative as you like with our lovely range of number plaques, available with a black, white, blue, green, red or brown background. Where the layout will allow, there is, in most instances, a choice of having the number plaque made vertically or horizontally when a number only is required. Please specify at the time of order. Where an emblem is to be included, such as an acorn, cluster of roses, daffodils or small flower spray, the plaque may need to be made vertically to accommodate it. Our larger Mews plaques can accommodate slightly larger emblems. All our number plaques have a choice of white, gold or black lettering. If you have more specific requirements, or don’t see what you are looking for please contact us as we may still have just what you need. Alternatively, new patterns and emblems can be made as a cost option. Our gallery shows various samples for design, layout and colour and our ‘Tips’ and ‘FAQs’ provide some useful and practical advise when it comes to choosing your sign. Please remember that our experienced staff are only a phone call away and are always pleased to help with any aspect of choosing your sign.